Acer unveiled Spin 7 in the country touted as the world’s thinnest convertible notebook at INR 1,09,000. The Windows 10 Home-based device features a 14-inch full-HD IPS panel with a resolution of 1920 x 1080 pixels coming with the added protection of Corning Gorilla Glass. The touch screen gets Acer Color Intelligence software which dynamically adjusts gamma and saturation in real-time, optimizing screen color and brightness. The display can be hinged at 360-degrees for easy convertibility. 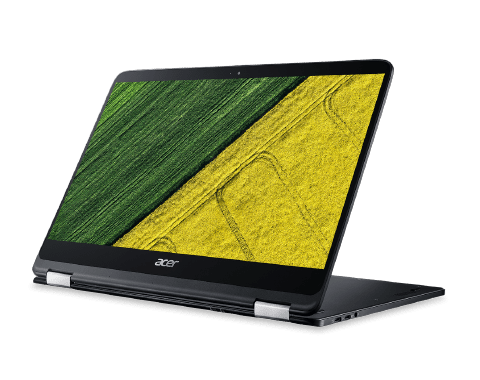 Spin 7 with an all-aluminium unibody further sports a seventh-generation Intel Core i7-7Y75 processor, 8 GB of LPDDR3 RAM, a 256 GB SATA III SSD, and two USB Type-C (USB v3.1) ports. It features Wi-Fi 802.11ac connectivity, a memory card reader packed with a the 4-cell 2770 mAh battery on board delivering up to 8 hours of performance. The Type-C ports also charge the machine. The device promises Dolby Audio Premium technology sporting a fan-less design, weighing just 1.2 kg. Spin 7 is sure to allow consumers enjoy extreme portability without compromising on performance or versatility, quoted Chandrahas Panigrahi, Sr. Director and Consumer Business Head, Acer India, at the launch. Acer Spin 7 would be available for sale through authorised retail stores across the country.